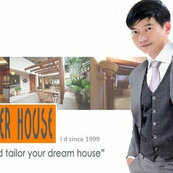 We will recommend Ronald Goh from Designer House because he and his team did a wonderful job. Their design satisfied our expectation and provided excellent service to us. He shows his professionalism and efficiency to provide ideas and concept of renovating our new house. He presented practical ideas on our daily living and to fit with our desiring modern, simple design against our budget. He is a person who is reliable and responsive. From time to time, he will follow up on the project progress and updates us with the photo taking. As he knows we need to move in by end of Jul, he monitors very well with the time schedule and adhere to the timeline. His hard work and professionalism exhibit over the period of the renovation absolutely deserve to be recommended.